Finchampstead church, Berks, was one of the very first churches I visited when, in 1976, I decided to consider taking up a new interest (as related in the opening paragraph here). 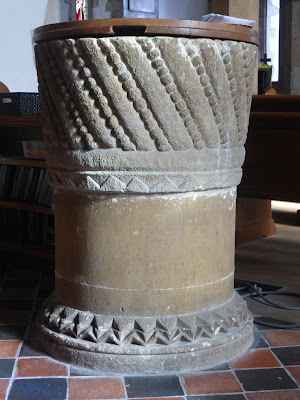 It might even have been the second one, after Hurst, Berks. 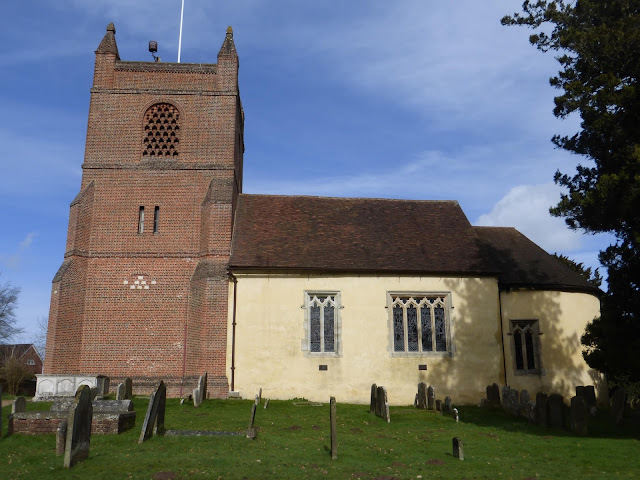 I remember little about that first visit to Finchampstead, except the church's dominating position on a small but steep hill and its handsome 18th century brick tower, and I hadn't been back until the last couple of weeks, when family matters obliged me to return to the scenes of my youth. It's clearly well-loved by its parishioners, and, while it's not going to make many best churches lists, it does have a welcoming atmosphere and some pleasing features; I especially like the Norman font with its diagonal bands, which make it look as if it's swirling around. 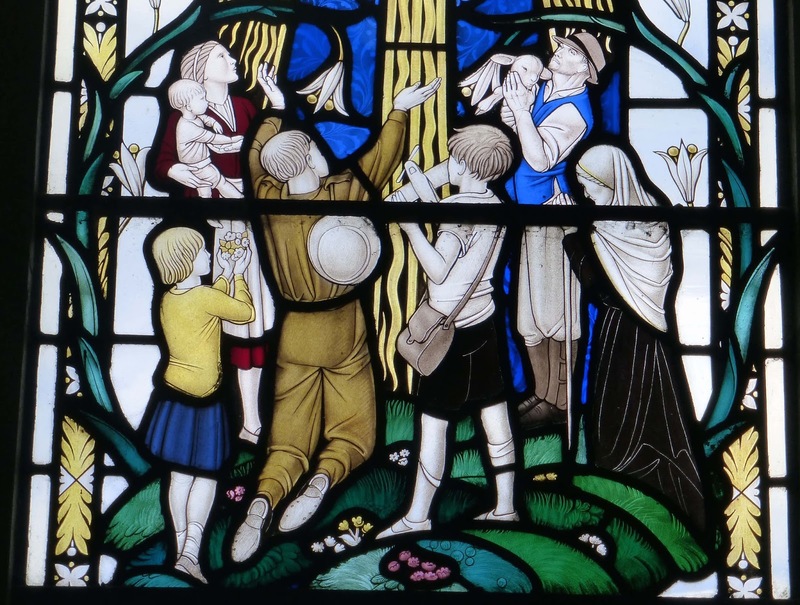 But my favourite object - and, I imagine, the favourite object of many other visitors - is the stained glass in the westernmost window in the north aisle. It dates from 1945, and is by Christopher Webb (1886-1966). 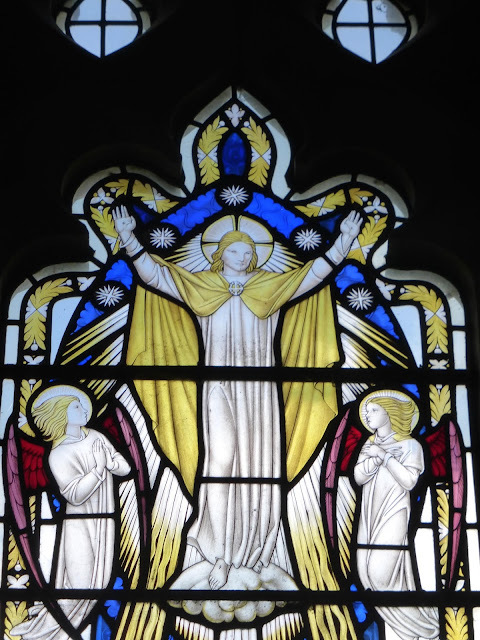 (The photo above omits three small lights at the top which are of little pictorial interest.) 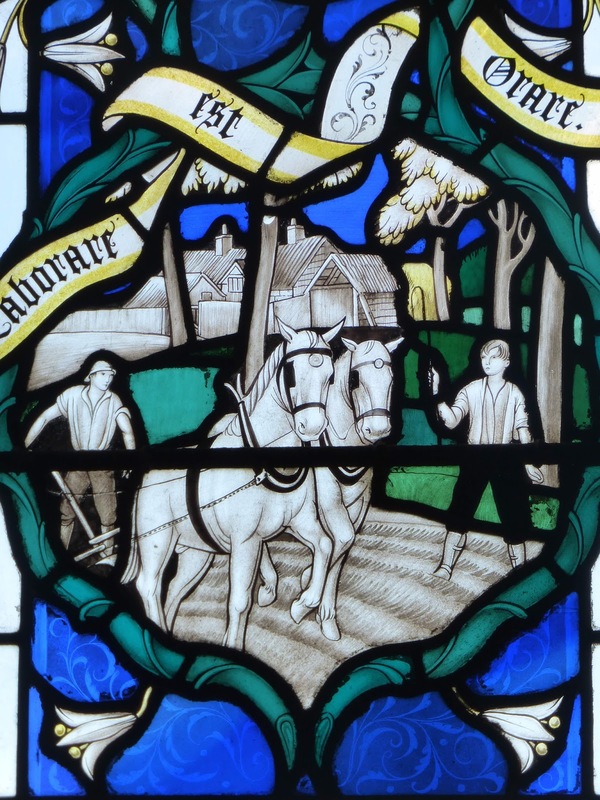 Webb was a prolific designer of stained glass (there are only two windows by him in churches in Berks, but in Herts, for example, there are no fewer than 37), though one I generally find unappealing. Insipid, twee, gutless, anaemic: these are words that could be, and have been, applied to his work. This window, however, teeters on the line between cheesy and charming, and manages to fall on the right side. It is, I have to admit, genuinely cute and capable of putting a smile on the face of even the most hardened Webb-sceptic. The window shows Christ in Majesty being adored by villagers. The top of the main light, showing Christ, is the weakest part of the design. * It conveys little sense of majesty, looking more like a singer smirkingly soaking up the applause of semi-hysterical fans. 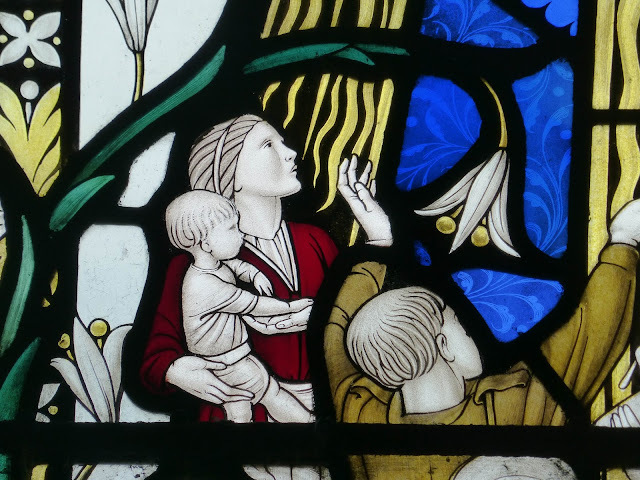 I quite like the two angels on either side, their hair swept back as if blasted by Christ's radiance. 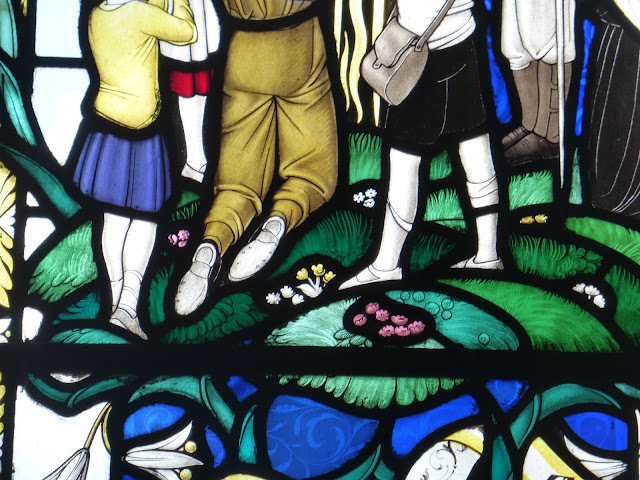 The girl offers some flowers (perhaps primroses), and the older man is holding a lamb. The schoolboy, satchel slung over his shoulder, raises a model aeroplane (I'm a bit frustrated that Webb doesn't reveal more of it so I could have a go at identifying the type - it's a single-engined monoplane with a squarish fuselage, but that's as far as I can get). The soldier, tin hat hanging down his back, the soles of his boots lovingly observed, reminds us that this window was made during or just after the war, which adds to its poignancy. 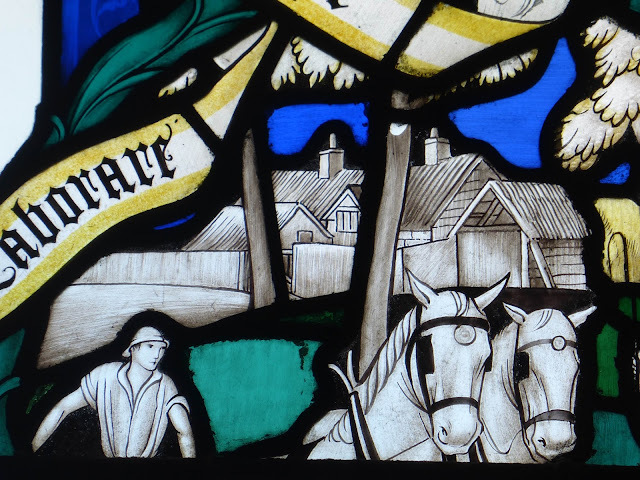 The sward and flowers at their feet are evocative of rural life. The final scene, at the bottom, is accompanied by the well-known Latin motto 'Laborare est orare', 'To work is to pray'. A ploughman and his young assistant work in a field with two blinkered horses, printing their proud hoofs in the receiving earth, all the details of tackle and plough apparently accurately delineated. 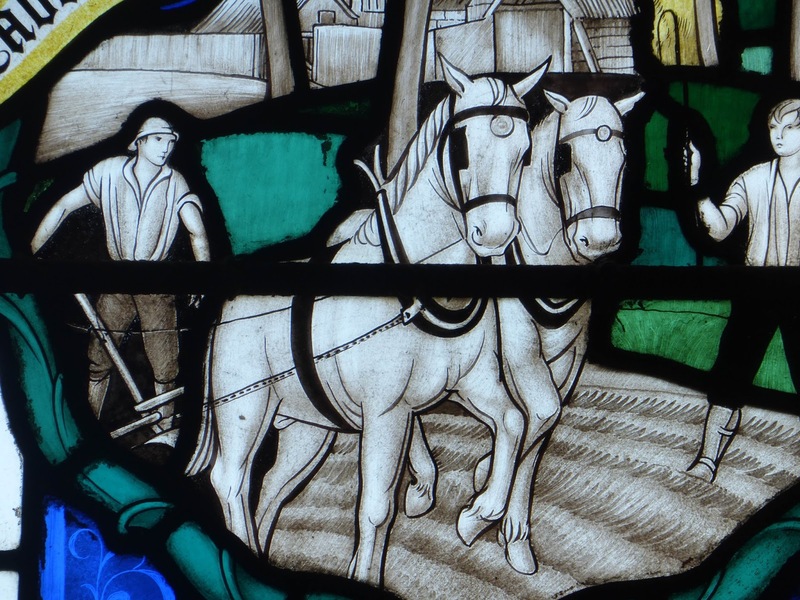 The farmhouse behind them looks humble; at first I thought that what seems to be a haystack behind it had a door, but close inspection reveals that it's part of the ploughboy's whip, slightly misaligned with the section of glass below. 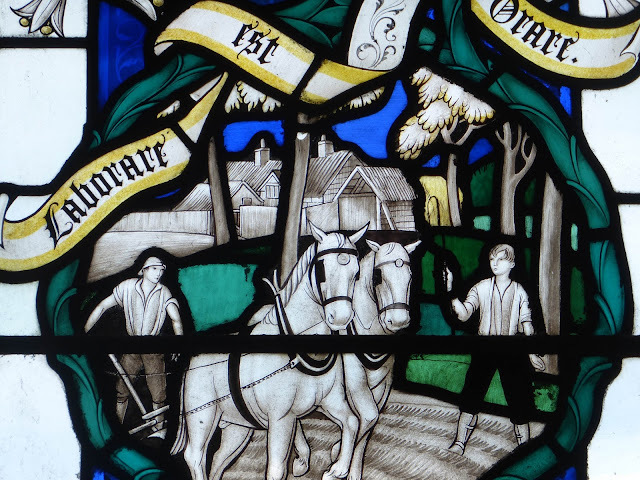 The scene is even more poignant because it freezeframes the moment when the plough was being routinely pulled by animals (oxen first, later horses), as it had been for very many centuries, for just about the last time. Tractors had been around for decades by the 40s, but horses still worked the land (petrol shortages in wartime must have played a part). Very soon after 1945, however, working horses were mostly retired, ending a practice that had lasted over a thousand years. The window records the horses' last outings. 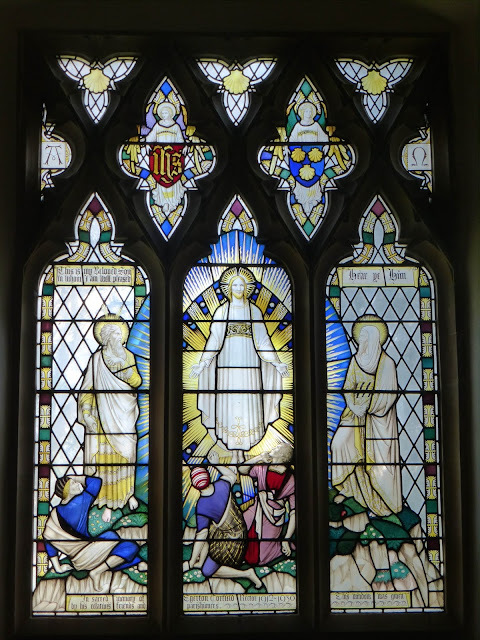 The other Berkshire Webb window is also in Finchampstead, in the east window. 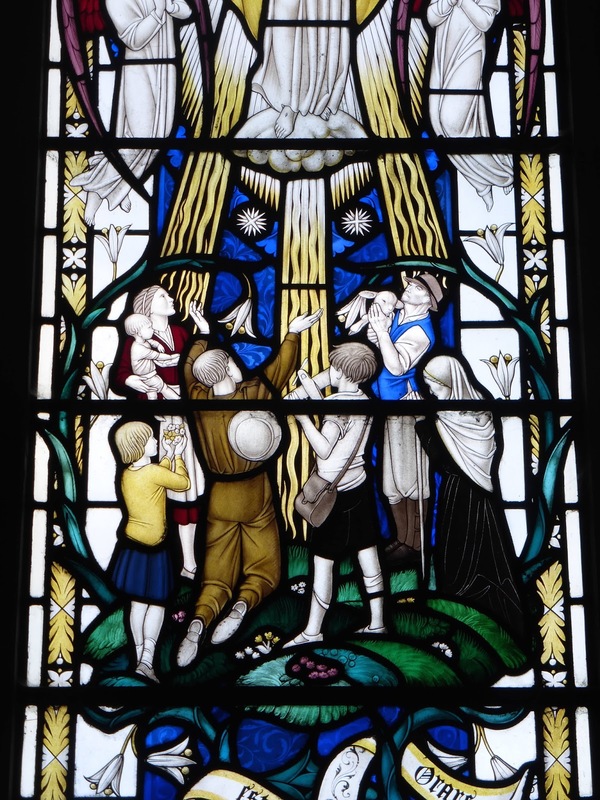 It dates from 1932 and shows the Transfiguration. 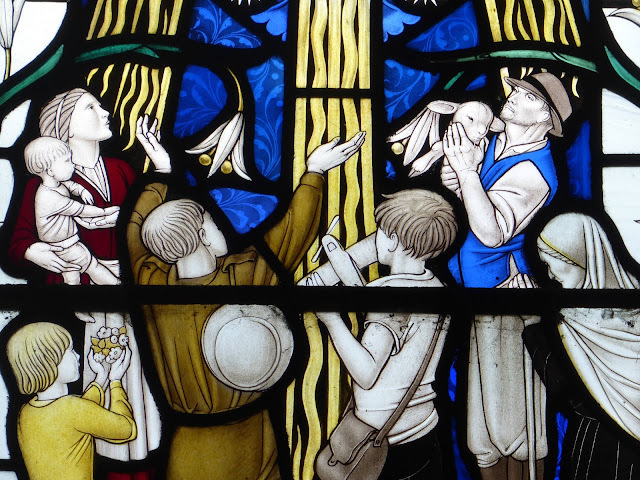 There's a degree of drama in the poses of the stunned disciples in the foreground, but otherwise it's all pretty tame. This is, I'm afraid, much more typical of Webb. One last aspect of the church I'll mention is that it has two north doors and one at the west end, that is, it has no south door. Although the majority of churches have their main entrance in the south there is a significant minority with it on the north side. However, I can't recall another church with no south entrance at all (but I'm sure others do exist). One reason why this is worth noting is that it should be remembered as counter-evidence whenever you read or hear about so-called 'Devil's doors', which are a favourite in depressingly many church guide books. It's often alleged that the superstitious medieval churchgoers believed that evil came from the north, and that the north door was kept open during baptisms so that the devil, expelled from the child, could make a quick exit. This is nonsense, as all sorts of evidence attests. Finchampstead church is open every weekday from 10 to 12. You'll be charmed. * Naturally, I realise that this is a subjective statement made to look as if it's objective and unarguable. Feel free to argue with me. All similar statements in this post and on this blog are subject to the same proviso: this is so obvious that I don't think it worth cluttering up my prose with continual "in my opinion"s and "I think"s.